The Bureau of Highways was created with the appointment of the Lake Tahoe Wagon Road Commissioner and the Bureau of Highways Commissioners. The bureau studied highway needs and made recommendations for a 4,500-mile state highway system. California’s Department of Highways was created and operated until 1907 when the state Department of Engineering was created. The state legislature made its first appropriation for certain state roads. The State Department of Engineering was created. The Department of Highways and Lake Tahoe Wagon Road Commission were placed under the control of the department. California’s legislature passed the state’s first state highway bond. In 1910, voters approved the State Highways Act of 1909. It provided $18 million for construction and acquisition of a state highways system. The three-member California Highway Commission was created to oversee highway maintenance and construction. Legislation also provided for a state highway engineer, appointed by the governor to serve as the commission’s executive officer. The first state highway construction contract was awarded and signed, with work beginning the same year. Awarding this contract marked the beginning of construction on the Highway 1, El Camino Real, Pacific Coast route. The first state gas tax was created to fund the expansion of the state highway system. Initially, the tax was set at 2 cents a gallon. Accompanying legislation also created the "Motor Vehicle Fuel Fund," with some of the money going directly to counties and other funds being deposited into the "State Highway Maintenance Fund" for maintenance, repair, widening, resurfacing, and reconstruction of state highways and roads and highways in state parks. The state sign route numbering system was adopted. The San Francisco–Oakland Bay Bridge opened to traffic. The bridge represented a remarkable engineering and political achievement. State Route 1, also known as the Pacific Coast Highway, was completed and served as an important tourist and commercial corridor. 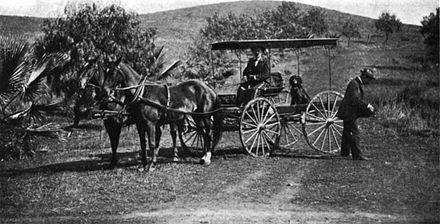 This is was California’s first complete north-south highway. The Arroyo-Seco Parkway, California’s first freeway, was dedicated on December 30, 1940. This project marked the beginning of the freeway era in the Golden State. The Collier-Burns Act was passed and provided $76 million annually for new highway construction. Gas and diesel taxes were raised by 1-1/2 cents a gallon and driver license and registration fees were increased. The Division of Highways was reorganized to deal with the greater volume of work the act generated. California’s gas tax was increased to 6 cents a gallon to fund highway improvements. President Dwight D. Eisenhower signed the Federal-Aid Highway Act of 1956. Under the act, the federal government supplied 90 percent of funding for interstate highways, with the state paying the remaining 10 percent. The Winter Olympics in Squaw Valley served as impetus to build Interstate 80. Interstate 80 became the first all-weather, trans-Sierra Nevada highway and was nationally recognized as a major engineering achievement. California established the Highway Transportation Agency that consisted of the Department of Public Works (which included the Division of Highways), Department of Motor Vehicles, and the California Highway Patrol. The Collier-Unruh Act was passed and authorized the first rapid transit funding. The bill allowed counties to increase the in-lieu tax by one-half cent to develop rapid transit systems. The legislature also increased the gasoline tax to 7 cents a gallon. Governor Edmund G. Brown on May 14, signed Senate Bill 64 into law. The bill provided for renumbering the state highway system, effective July 1, 1964. The Highway Transportation Agency was renamed the Transportation Agency. California’s first traffic management center in was established in Los Angeles. The 42-mile surveillance loop included the Santa Monica, San Diego, and Harbor freeways. This was a significant milestone in developing a fully-automated traffic management system and included elements such as underground loop detectors and ramp metering. The passage of the Transportation Development Act extended the state's retail sales tax to include gasoline, and provided for a portion of that revenue to be returned to local governments for transportation. This provided a significant new source of revenue for local transportation facilities, in particular, for transit. The California Department of Transportation (Caltrans) was formed to unify all transportation functions under a single department. The California Transportation Commission replaced the California Highway Commission, State Transportation Board, Aeronautics Board and California Toll Bridge Authority, for the purpose of advising and assisting the governor and legislature in formulating and evaluating state policies and plans for transportation programs. The Business and Transportation Agency was renamed the Business, Transportation and Housing Agency to better convey its broader mission. California’s gas tax increased to 9 cents a gallon, the first increase since 1963. Caltrans established its 12th and final district. The new district was in Orange County. The massive Loma Prieta Earthquake occurred on October 17, raising awareness for the need to strengthen and retrofit state highway bridges. After the earthquake, emergency transportation was greatly impacted in the Bay Area; however, Caltrans reopened the Bay Bridge in an amazing 30 days. The state gas tax increased to 14 cents a gallon with a yearly increase of 1 cent a year for four more years. A State Master Plan for Transportation was adopted, with a focus on reducing traffic congestion and an emphasis on expanding bus, rail and other public transit systems instead of adding more freeways. The state’s gas tax reached 18 cents a gallon. 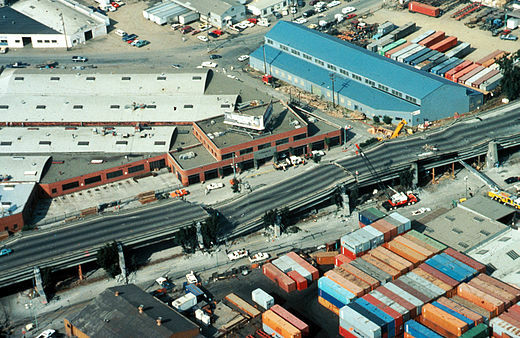 After the January 17 Northridge earthquake in Los Angeles, Caltrans reconstructed Interstate 5/State Route 14, the Gavan Canyon Bridge, and the Santa Monica Freeway Interstate 10 in record time. The passage of Senate Bill 45 substantially changed the process by which state and federal transportation funds are allocated, placing most of the responsibility for planning and prioritizing project funding in the hands of local and regional agencies rather than the state. To improve efficiency and reduce congestion, the Carquinez Bridge’s first dedicated electronic toll collection lane opened in August. The first Amber Alert notification occurred on August 1, when two teenage girls were abducted near Lancaster. Caltrans District 9 equipment operator Milton Walters spotted the abductor's white Bronco, scratched the license number in the dirt and on his lunchbox and contacted the California Highway Patrol. Voters approved the Transportation Congestion Improvement Act, also known as Proposition 42, to protect transportation funds. The act limited using transportation funds for nontransportation-related needs. Caltrans developed the Goods Movement Action Plan, which offered solutions to improve goods flow, while reducing environmental impacts related to good movements. The Department also distributed $5 million in federal funds as grants to metropolitan planning organizations to produce regional blueprint planning documents designed to improve environmental quality. Voters approved Propositions 1A and 1B. Proposition 1A permanently protected Proposition 42 transportation funds and required previously diverted funds to be repaid. Proposition 1B authorized the sale of $19.9 billion in bonds for a broad range of transportation projects. The San Francisco–Oakland Bay Bridge self-anchored suspension span contract was awarded in April, which was the largest public infrastructure contract in California's history. Caltrans seismically retrofitted 99.5 percent of all state-owned bridges, making them stronger and safer if a major earthquake occurs. Caltrans, working with its partners in the private sector and government, oversaw the reconstruction of the Interstate 880 and Interstate 580 approaches to the San Francisco–Oakland Bay Bridge in a record 26 days following a devastating accident that compromised the structure. The Devil’s Slide project began construction on State Route 1 in San Mateo County in September. Caltrans designed the project to bypass the dangerous and maintenance-intense Devil’s Slide that was frequently closed because of storm damage. When complete, the project will consist of two parallel 4,200-foot-long tunnels and a two 1,000-foot-long bridges. In October, Caltrans quickly responded to a fiery tunnel crash on Interstate 5 near Santa Clarita that killed three people and involved 31 vehicles. Caltrans cleared the tunnel and reopened the route in a remarkable three days. Caltrans, for the first time in history, oversaw $10 billion of construction on the State highway system. Caltrans completed the traffic-interfering work associated with rehabilitating the "boat section," a 3/4-mile stretch of Interstate 5 in Downtown Sacramento. The work was completed in a record 38 working days, rather than the projected two years, with minimal inconvenience to the public. California received $3.64 billion from the American Recovery and Reinvestment Act (Economic Stimulus Package) for transportation and was the first state to obligate $1.5 billion to projects. These projects include a $1 billion lane widening on Interstate 405, a $13.5 million project to resurface and repair a 50-year-old section of Interstate 80 in the Bay Area and $1 billion to replace sections of Doyle Drive in San Francisco. Caltrans debuted "QuickMap," an online app that provides real-time traffic and travel information to state highway motorists. No single source previously existed for integrated information focused on highway travel. QuickMap is seamless, statewide, and users choose the information displayed, such as California Highway Patrol incidents and color-coded traffic speed. As of 2016, the QuickMap app is also available for mobile devices, however Caltrans cautions users to be safe, check the roads before you go, and never use the app while driving. The app is available by searching "Caltrans" in Apple's "App Store" and in Android's "Google Play Store." It is also available online at Caltrans' QuickMap page. The Tom Lantos Tunnels at Devil’s Slide on State Route 1 in San Mateo County opened to morning traffic on March 26. The new tunnels were Caltrans’ first completed tunnel project in nearly 50 years and fix a coastal route notorious for rockslide closures and provide a safe, dependable highway between Pacifica and Montara. A government reorganization plan replaced the Business, Transportation and Housing Agency with a new California State Transportation Agency (CalSTA) focused solely on transportation. CalSTA's mission is to develop and coordinate the policies and programs of the state’s transportation entities, to achieve the state’s transportation system objectives for mobility, safety and air quality. On September 2, the new East Span of the San Francisco-Oakland Bay Bridge opened to traffic. The opening of the new seismically safe span is more than just an upgrade of one of the country's busiest bridges – it is an epic transformation of the bridge into a global icon. After three years of construction, the Caldecott Tunnel Fourth Bore tunnel between Alameda and Contra Costa counties opened to traffic on November 16. When funding was awarded in 2009, the Fourth Bore Project was the largest stimulus-funded transportation project in the country. Caltrans released its new 2015-2020 Strategic Management Plan, which maps out how the Department will increase performance, efficiency, and innovation as it increasingly considers sustainability and all modes of transportation. As part of the new multimodal focus, Caltrans revised its mission, which is to "provide a safe, sustainable, integrated and efficient transportation system to enhance California’s economy and livability." The Department is also setting performance measures to track its progress in achieving its updated goals of Safety and Health; Stewardship and Efficiency; Sustainability, Livability and Economy; System Performance and Organizational Excellence. On April 28, Governor Edmund G. Brown Jr. signed Senate Bill 1, closing a funding gap for the basic maintenance and upkeep of the state’s transportation infrastructure with an investment of approximately $5.2 billion per year. This stable source of revenue will fund "Fix it First" deferred maintenance projects on state highways, while providing funding to enhance trade corridors, transit, and active transportation facilities, in addition to repairing local streets and roads throughout California.